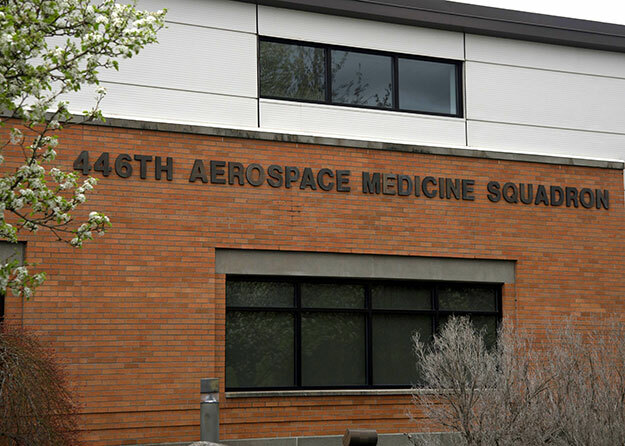 For more than a year, Rainier Wing airmen have been taking care of their medical needs in different facilities around McChord while the 446th Aerospace Medicine Squadron building was being renovated. The experience meant a less private and intimate session with providers, and often times customers had many stops. To showcase the revitalized facility, the 446th AMDS is holding an open house May 5 at 10 a.m. The renovated clinic will also allow airmen to take care of most of their medical readiness requirements in a one-stop shop. "With the revitalized building, we hope to see more enhancements in the flow of seeing patients," said Senior Master Sgt. Richard Yager, Chief of Health Services Management for the 446th Aerospace Medicine Squadron. "We're hopeful that this will speed up the time patients are waiting to see a physician during Periodic Health Assessments." The building was outdated and it was time for a remodel, Yager said. "PHAs used to be conducted in a wide-open area separated by cubicles," said Yager. "This didn't provide much privacy for our patients during their PHAs." However, the 15-month remodel changed this and looks more like a standard clinical office, Yager added. "There were separate rooms for the purpose of blood pressure and questions the nurse needed to ask (during my PHA)," said Master Sgt. Eric Rea, 446th Maintenance Squadron avionics craftsman. "This greatly increased privacy over medical concerns." During his visit, Rea also noted the facility was more secure. In addition to the updated facility, Yager said the 446th AMDS has worked to improve its capabilities including patient tracking, individualized care and a larger waiting room. "We're working towards a team concept," said Yager. "This will allow for physicians, medical administrators, and medical technicians to be assigned to a specific squadron in order to get to know their patients better and keep better track of their health management."